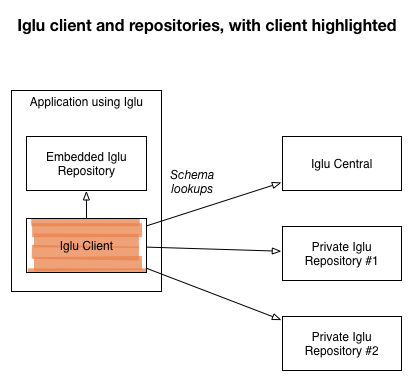 A Scala client and resolver for [Iglu schema repositories] iglu-wiki from the team at [Snowplow Analytics] snowplow-website. Iglu Scala Client is used extensively in [Snowplow] snowplow-repo to validate self-describing JSONs. For a presentation on how we came to build Iglu, see [this blog post] snowplow-schema-post. The latest version of Iglu Scala Client is 0.5.0, which is cross-built against Scala 2.10.x and 2.11.x. val igluClient = "com.snowplowanalytics" %% "iglu-scala-client" % "0.5.0"
Note the double percent (%%) between the group and artifactId. That'll ensure you get the right package for your Scala version. Primary entity for working with Iglu Scala Client is com.snowplowanalytics.iglu.client.Resolver. Resolver companion object has parse method which allows you to create Resolver instance from [resolver configuration] resolver-config. Second working method is lookupSchema, receiving Schema key as String or directly com.snowplowanalytics.iglu.SchemaKey object, this method traverse all configured repositories trying to find Schema by its key. val resolverConfig: JsonNode = ??? Above snippet returns mobile context JSON Schema if you provide correct resolverConfig. If not you will get all errors (like invalid format, network failure, etc) accumulated in scalaz.NonEmptyList, which itself is left side of scalaz.ValidationNel, structure isomorphic to native Scala Either. Iglu Scala Client is copyright 2014-2017 Snowplow Analytics Ltd. Licensed under the [Apache License, Version 2.0] license (the "License"); you may not use this software except in compliance with the License. libraryDependencies += "com.snowplowanalytics" %% "iglu-scala-client" % "0.6.0-M1"